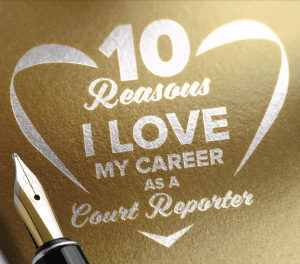 Court reporting is becoming an increasingly attractive career choice. There is a well-publicized shortage of court reporters, the training time can be relatively short and inexpensive, wages are above-average, and the varying types of court reporting allow for flexibility throughout one's career. If you're interested in becoming a court reporter, how will you know if you have what it takes to be successful? First, you have to know what is expected of a court reporter. A court reporter’s primary responsibility is to record the spoken word as quickly and as accurately as possible, no matter how technical the testimony is. They must also deliver an accurate, verbatim transcript to attorneys or appellate courts by a specified deadline - sometimes overnight. Regardless of whether a court reporter works in a courtroom, a hearing room, or in freelance depositions, schedules can change quickly. A courtroom-based reporter might be asked to stay late at the last minute because a jury is deliberating, or to come in early the next day to accommodate a witness schedule. A freelance court reporter's deposition schedule can change multiple times throughout a week. Depositions can cancel at the last minute, or transcript orders can be expedited with no prior warning. Court reporters are expected to roll with these changes with professionalism and while still providing a high-quality product. If you have these traits, you should consider a career as a court reporter - we need you! Strong grammar and punctuation skills. Strong work ethic and discipline. Thirst for learning; intellectually curious. Tech-savvy, ability to keep up with changing technology. Thrive under pressure; able to meet short deadlines. Another interesting commonality among successful court reporters is that many of them play a musical instrument, specifically the piano.